After the longest and most painful government shutdown in US history, Federal employees finally received a paycheck on January 31, 2019. Thanks to the Government Employee Fair Treatment Act, they received back pay for the 35 days they were locked out of their jobs. On December 22, 2018, a budget impasse in the US Senate interrupted the flow of funds to government agencies, causing them to close or reduce operations, which resulted in the furlough of over 800,000 government workers nationwide. 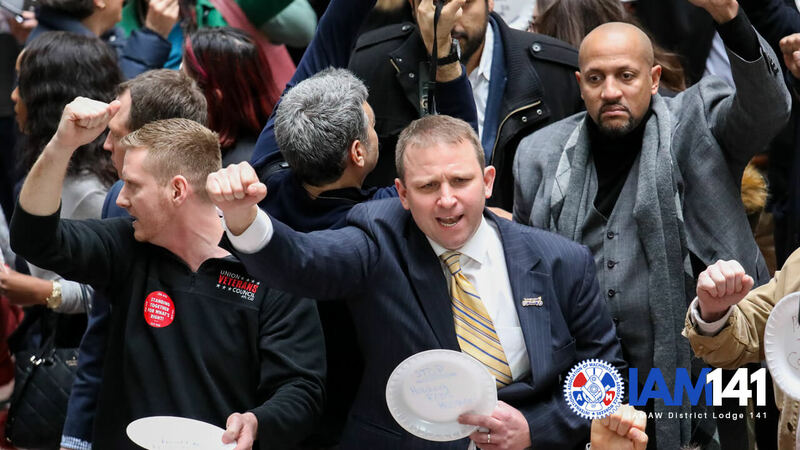 Goiam.org documented the relentless pressure that IAM-NFFE leadership put on lawmakers, and how they mobilized allies to join the fight and speak out against the mistreatment of government employees. 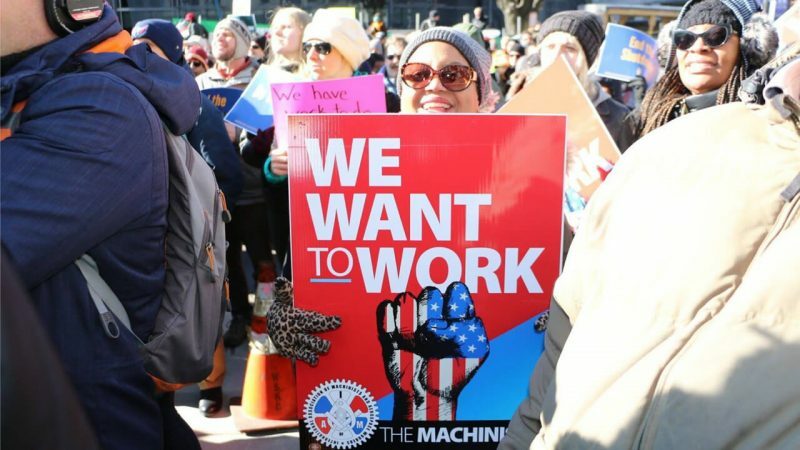 On January 10, in spite of the cold temperatures, over 2,000 federal employees, their families and allies gathered at a rally in front of the AFL-CIO headquarters in Washington, D.C. demanding that lawmakers do their jobs so federal workers can do theirs. Richard Trumka, President of the AFL-CIO, denounced the shutdown and called it a “lockout” of government employees who want to work. Union representatives continued their hard work through the following week, filing lawsuits and staging another protest to demand that lawmakers put legislation up for a vote on the Senate floor to end the shutdown. Facing a deepening crisis as the shutdown entered a second month, many workers were near their breaking point as bills piled up and no congressional deal was in sight. The national transportation unions sounded the alarm and raised serious concerns. Just two days after the unions’ announcement, the busiest air traffic system in the country began to experience delays in the air space between La Guardia Airport in New York and Washington, D.C. The problems were due to a shortage of air traffic controllers, which was a direct result of the shutdown. After five weeks of courageous activism and perseverance in the face of hardship, workers proved their worth and the power of solidarity. Many observers point out that talks of a general strike and the air traffic stoppage were the turning point that finally convinced the president to reopen the government. The American organized labor movement that many had left for dead after the disastrous Janus decision last summer showed how it could organize, mobilize and stay united to show real worker power. 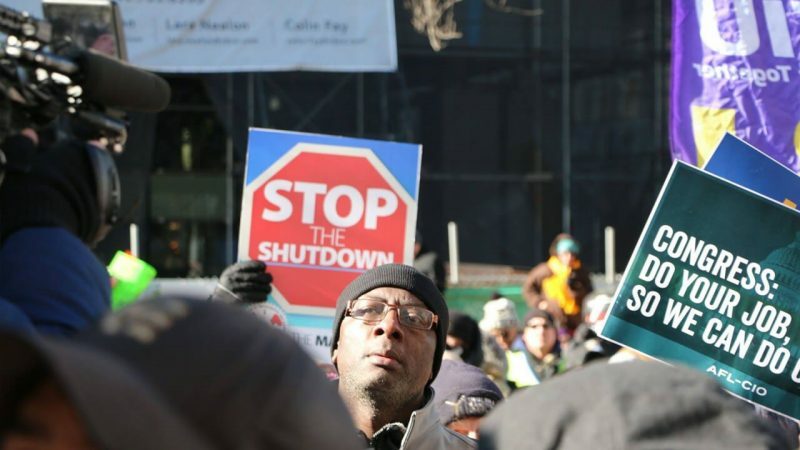 The labor movement that anti-union corporate defenders hoped to kill held rallies, directed phone and email campaigns, collected donations and organized food banks to help the furloughed workers. Their leaders went as far as engaging in civil disobedience to call attention to the plight of federal workers who were only demanding that they not be used as political pawns. In a sharp, yet familiar contrast, the so-called ‘right-to-work’ defenders were nowhere to be found when the going got tough for 800,000 workers who just wanted the right to work to make a living. 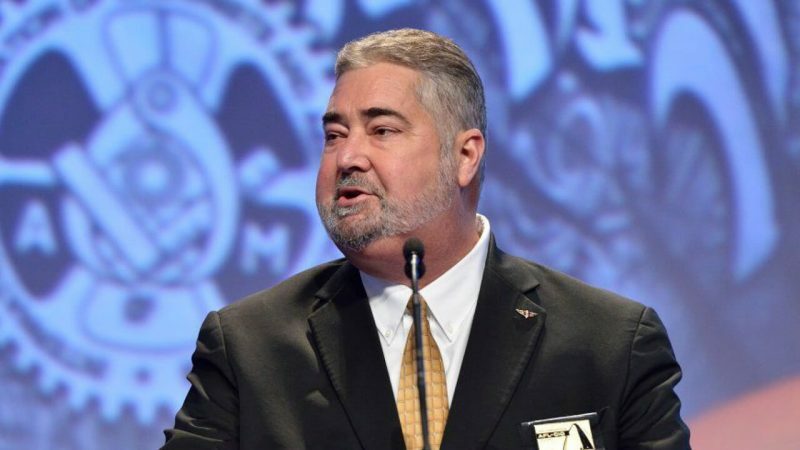 Leo W. Gerard, President of the United Steelworkers, exposed what he calls the “lie at the heart of the anti-union ‘right-to-work’ movement” in an excellent article. The government is once again open for business. While the damage to the nation’s economy, nature and scientific research will take years to repair, the Machinists Union is leading the call for fairness in the treatment of federal contractors. The number of private sector contractors performing government functions has increased in recent years, but these workers are typically not included in bills that restore pay for federal workers after a government shutdown. The Machinists Union supports the Fairness for Federal Contractors Act, H.R. 824, a bipartisan bill introduced by Representative Donald Norcross (D-NJ) and co-sponsored by Representative Chris Smith (R-NJ). TAKE ACTION: Please contact your representative and ask them to support H.R. 824. The crisis generated by the shutdown has been stopped, but it is a short-term victory. Funding for the government is only guaranteed until February 15. All eyes will be on President Trump when he addresses the nation in the State of the Union speech. IAMAW International President Bob Martinez will be in attendance as a guest of Representative Norcross, who is one of just over a dozen union members who serve in Congress. As for the ‘right to work’ defenders, don’t expect them to join the call for fairness for workers in the face of another possible government shutdown. Mr. Janus himself, after claiming that union dues infringed on his performance of a job he “loved,” has cashed in his union benefits and now works for the conservative think tank that bankrolled his case all the way to the Supreme Court. While the opportunists “ghost” us, union members and activists will continue to stand in solidarity and speak with one voice. We do the work.